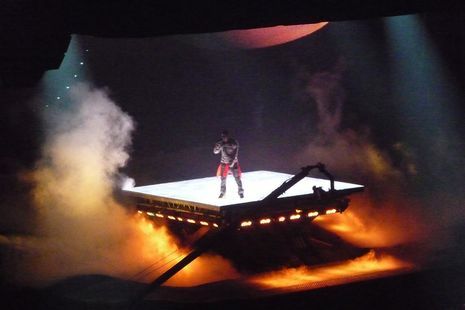 The Glow In The Dark Tour is a critically acclaimed world concert tour by Kanye West, which featured various high profile support acts including Lupe Fiasco, Rihanna, N.E.R.D and Nas. It began on April 16, 2008 in Seattle, Washington and travelled to Latin America, Asia, Europe, New Zealand and Australia through to early December. The tour featured some surprise special guest artists, including Girls Aloud, Gnarls Barkley and Jay-Z. Chris Brown also appeared at some shows to perform his remix of "Umbrella" with Rihanna, and as a dancer for N.E.R.D. For the New Zealand and Australian leg of the tour special guests Nas and New Zealand rapper Scribe have replaced Lupe Fiasco and N.E.R.D, as N.E.R.D is touring these countries separately. For the Asia leg, Taiwanese American singer Vanness Wu performed as the opening act on the Asian leg of the tour and performed "Good Life" with West during the show.